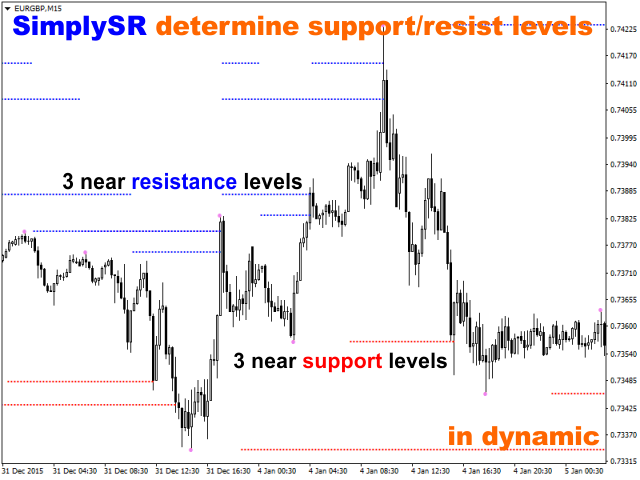 The indicator shows the support/resistance levels. Used to determine the takeprofit/stoploss values and to place the pending orders. The clear display makes the Simply SR convenient both for direct trading and for historical data analysis. 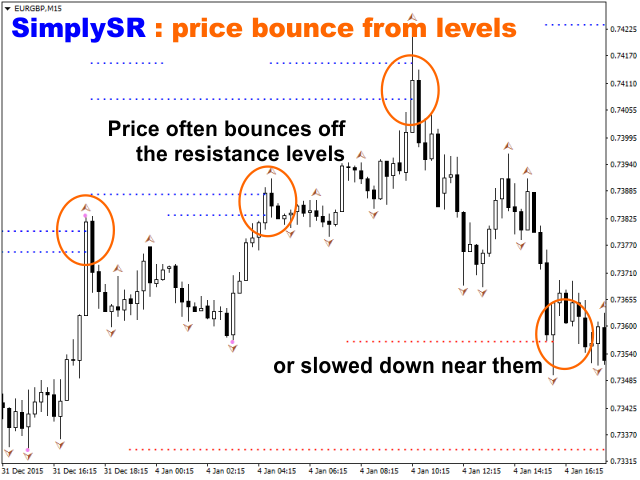 The levels are calculated as close as possible to the way they are seen by a trader, and to the way the zigzags move during the graphical plotting. 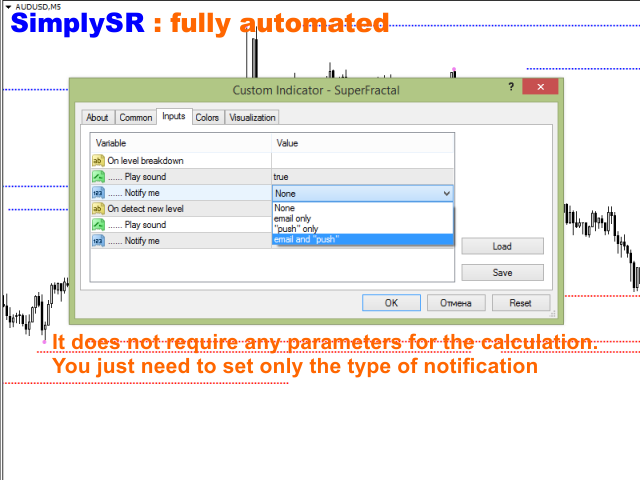 Thus the Simply SR is suitable for all timeframes and tools. The calculation buffers are organized in order to facilitate the use of the indicator in the Expert Advisors. SimplySR is displayed as three blue bands above the price level and as the three red bands below the price level. Accordingly, thees are the closest potential support and resistance levels. The support and resistance levels are used for placing the StopLoss/TakeProfit when making trades by market and for placing pending orders. Strong levels are determined by the length of the corresponding line. Close adjacent lines also mean a strong level. 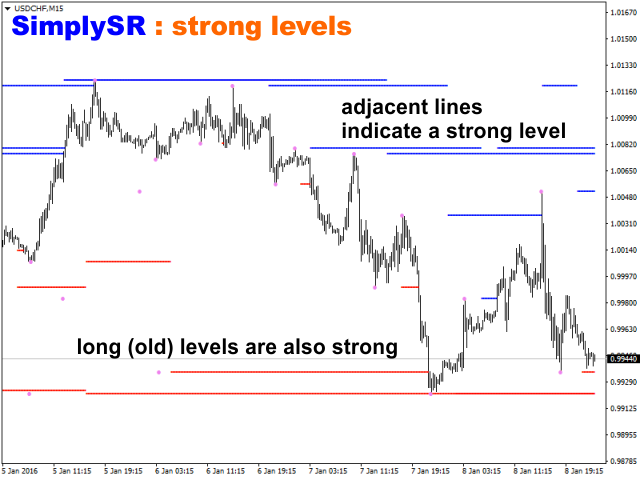 Simply SR indicates the potential position of the levels. When placing orders consider to the psychologically important lines (round) close to the levels, as well as the strength of the momentum the market volatility. The SimplySR does not require any input parameters for determination and placement of the levels.